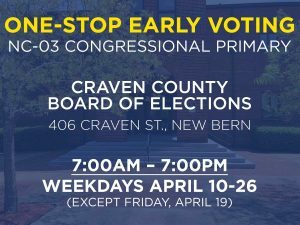 Due to Hurricane Florence, all scheduled events for the Craven County Democratic Party have been CANCELLED, and our headquarters will be CLOSED, from Wednesday 9/12 to Sunday 9/16. Meet our 2018 Democratic Candidates! The 2018 primaries are complete, and we’re proud to unveil our 2018 Democratic ticket in Craven County! We applaud all of the candidates who ran in the 2018 primary, and we’re committed to working our tails off to ensure that our nominees are successful in the general election! In this installment in our ongoing Meet the Candidates series, get to know Rufus Carter, Jr. and Theron McCabe, running for the Democratic nomination in District 5 of the Craven County Board of Commissioners. Meet Ginger Garner and Dorothea White, running for the Democratic nomination in NC Senate District 2, in this installment of our ongoing Meet the Candidates series. Get to know the candidates who are running in the 2018 primary election! Introducing Bryson Jones and Jerry Langley, running for the Democratic nomination in NC House District 79, in the latest installment in our ongoing Meet the Candidates series, helping you get to know the candidates who are running in the 2018 primary election! It’s the first installment in our ongoing Meet the Candidates series, helping you get to know the candidates who are running in the 2018 primary election! Today: Charles Dudley and Barbara Lee, running for the Democratic nomination in NC House District 3. Filing for 2018 candidates has officially closed, so we’re proud to unveil this year’s Democratic candidates for office: a diverse group that includes political newcomers with bold, fresh ideas, and seasoned political veterans with proven leadership. Dorothea White, chair of the Craven County Democratic Party, has filed for candidacy in North Carolina Senate District 2. As another Democratic candidate, Ginger Garner, has also filed for that seat, there will be a contested Democratic primary for that seat on Tuesday, May 8. According to the North Carolina Democratic Party’s Plan of Organization, any county party officer who is a candidate or campaign manager in a contested Democratic primary must temporarily step down from his or her position until the primary election, in order to ensure that the county party organization isn’t biased towards one candidate in the primary. Therefore, as of Tuesday, February 27, Ms.
Like so many others in North Carolina and across the country, we’re shaken and grieving after yet another school shooting took the lives of 17 innocent people.